Tips for the Weekend Warrior: with UVA Basketball's Mike Curtis from UVA Magazine on Vimeo. Calling Mike Curtis simply a strength and conditioning coach doesn’t do justice to the full scope of his job. He’s part physical therapist, part biodynamics expert and part injury-prevention guru. 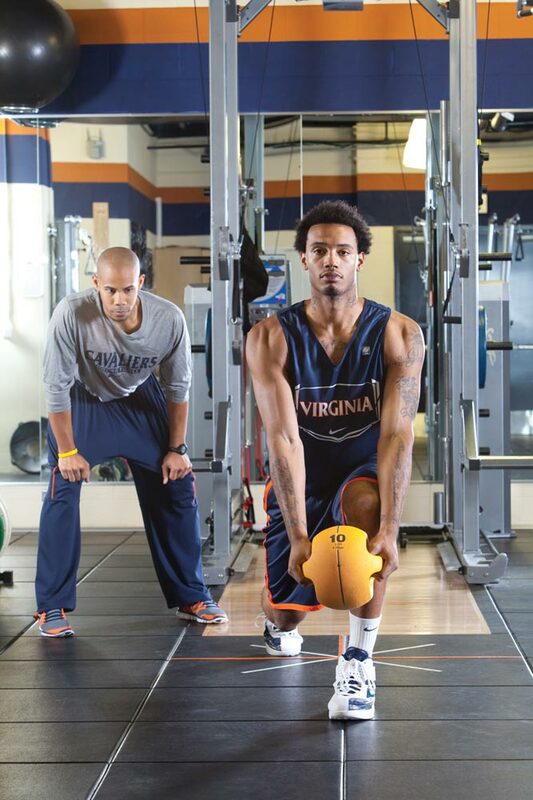 He draws on all of that knowledge every day as the UVA men’s basketball program’s strength and conditioning coach. Curtis (Educ ‘98, ‘00) works closely with team nutritionist Randy Bird and head athletic trainer Ethan Saliba to ensure that each of the program’s players is in top physical condition and prepared for the rigors of the notoriously difficult ACC schedule. Now entering his third season with the Cavaliers, Curtis, who played at UVA and was co-captain in the late 1990s under former head coach Jeff Jones (Col ‘82), has a nearly ideal background for the tasks at hand. His professional résumé includes stints with the Memphis Grizzlies and the University of Michigan, experiences that inform his approach to the variety of challenges at UVA. Mike Scott, the Cavaliers’ 6-foot-8, 237-pound power forward, has been one of the program’s most productive players in Bennett’s time at the helm. Scott started last season with a bang, averaging 15.9 points and 10.2 rebounds per game in his first 10 games. Curtis’ program and Scott’s hard work had clearly paid off in a better-conditioned athlete capable of making a huge impact on the ACC. Then an ankle injury and a pair of surgeries cut short his season and left Scott to apply for a medical redshirt. With his ability to condition affected significantly by the ankle problems, Scott, now a fifth-year senior, is looking as ready to roll as he did at the start of last season—with Curtis’ help. Curtis was quick to give the credit to Scott, who managed to keep off extra weight and worked hard throughout his rehabilitation not only to maintain but improve his functional strength. While Scott’s injury was a largely isolated incident, veteran point guard Sammy Zeglinski (Col ‘11) has been through several frustrating injuries since joining the Cavaliers that have required hip, ankle and knee surgeries. Curtis has had to alter the senior’s conditioning and workout plans accordingly to keep something else from happening. Zeglinski went down with a knee injury early last season, the latest in a series of seemingly compounding issues. That led Curtis to try to strengthen Zeglinski’s foundation and correct the source of the problem. “He has a lack of ankle mobility from his first-year injury [a surgery that included inserting a pin into his foot]—a lot of it is trying to fix those movement patterns,” Curtis said. Curtis’ adjustments with 7-foot center Assane Sene (Col ‘12) have helped him avoid a pattern common among 7-footers. They traditionally have a checkered injury history because of their extreme height, which has a significant impact on the body’s biodynamics. Sene has avoided that, and he’s getting stronger in the process, with Curtis’ guidance. In particular, Sene had to adjust his eating habits to bulk up his frame. Curtis has adjusted exercises to take Sene’s height into account, which has helped protect the senior from most injuries. Bennett has certainly noticed the extra attention. That’s a key part of Curtis’ expansive, influential role on UVA basketball and his unique blend of passion and expertise.